﻿Gina Blaxill wanted to be an author pretty much from day one – she started writing properly when she was eight and hasn’t stopped since. She lives in North London and studied English at Cambridge University, where she specialised in schoolgirl fiction and took part in a lot of musicals. These days she works in schools liaison, helping teenagers figure out the mysteries of higher education. Apart from writing she enjoys drawing comic art and exploring London and has big soft spots for dogs, stately homes and fruit. Ros has a secret crush on Jonathan. Jonathan is massively hung up on Freya (even after she dumps him). And Freya? Well, Freya is a beautiful enigma. Even more so when she goes missing without a trace . . . Pretty Twisted was an amazing story one which I enjoyed very much. I don't normally say this but I could read it again. I will read it again as I think it could be the best book I've read yet!! I really liked reading about Ros and her sisters relationship as everything worked out perfectly in the end for them. Through the whole book I felt I could relate to Ros, and you will too if you read it. Gina's writing in the entire book was tremendous. Writing about two people meeting online isn't easy and I think the way the book panned out worked really well with the story. I loved the ending of Pretty Twisted, No one could have asked for a better ending. Without me babbling on anymore and trying really hard to not give spoilers away. Go and purchase a copy of this book. You won't regret it. Hi Kerry-Ann!First off, I'm overjoyed you enjoyed Pretty Twisted so much - and even that you think it might be your favourite book so far! Knowing that makes all the hard work of writing it worthwhile.~ Hi Gina Thanks for taking the time out to answer some questions I really appreciate it and I know the readers do to, Can you tell people that don't know what your debut novel Pretty Twisted is about? ~ Where did you get the inspiration from for such an amazing book? The big inspiration was realising how few teen books really featured the Internet - online friends were a big thing for me growing up and I couldn't find any books that reflected this. 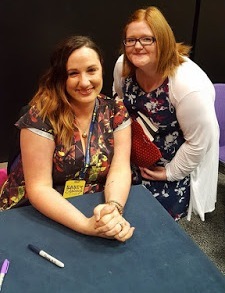 I thought it would be most fun to have two main characters - Jono was very much inspired by the teenagers on the country bus I was taking into work at the time, and I used a lot of my teenage experiences for Ros. After that, the rest of the story came. ~ I read Pretty Twisted in 3 days, (To me that's quick) as I wanted to see how it ended. I don't think you could have chosen a better way for it to end. Had you intended from the start for it to end the way it did? Pretty much!There were changes along the way but the last chapter remained the same through all of my edits. It felt true to the characters and that's often the most important thing. ~As I loved Pretty Twisted, I have to ask. Are you currently working on any other novels at the minute? *Fingers Crossed* Please say Yes! Yes! I'm currently writing my second novel which is also a crime thriller for young adults. Like Pretty Twisted, it's told by two teenagers, Sophie and Reece. They end up investigating the death of Sophie's cousin Danielle - it was always assumed that she committed suicide, but Sophie finds some photos on a memory stick that suggest it may have been murder. Sophie and Reece soon end up stumbling into criminal activity that goes way beyond what happened to Danielle. ~Are you a night Owl or an Early Bird Writer? Definitely an Early Bird - the creative part of my brain switches on as the day goes on! ~Is there any advice you could give to aspiring authors out there? The two biggest piece of advice I would give are never give up and learn how to edit. Never give up was actually a bit of advice my dad gave me, and he was right - you'll face a lot of rejections in trying to become an author, but you have to believe in your book and keep sending it out. As for learning to edit - no one writes things right first time round (if anyone says they do, they're probably fibbing). Editing isn't just proofreading - it's thinking "do I need this line? is this word actually necessary? does this chapter actually advance the plot?" It's tough but editing is what makes something that's quite good really good. Also, I totally recommend reading what you write out loud! ~Who are your favourite authors? And what are your favourite books? My favourite writers are Agatha Christie, Kevin Brooks and I still have a very soft spot for Tamora Pierce who was my fave when I was a teenager. As for favourite books, some are Finding Violet Park by Jenny Valentine (it's very clever! ), The Hunger Games trilogy (who doesn't like those?)!) and The Diary of a Nobody (it's a very funny diary written by a Victorian gentleman - not aimed at teenagers, but easy to read). I've also got a soft spot for Born to Run by Michael Morpurgo, which is about a greyhound and had me sobbing the whole way through - my pillow was soaked by the time I was done! ~On last question can you tell readers one random fact about yourself? I absolutely love fruit! Quite often I'll eat about ten of my five a day, and when I'm at work, I always have to eat my eleven o'clock apple. Hope you enjoyed reading these, and thank you for sending me such wonderful questions! I want to give a BIG thanks to Gina who is such a fantastic author for writing Pretty Twisted, and for taking the time out to answer my questions. I really appreciate it. Thank you so much! !